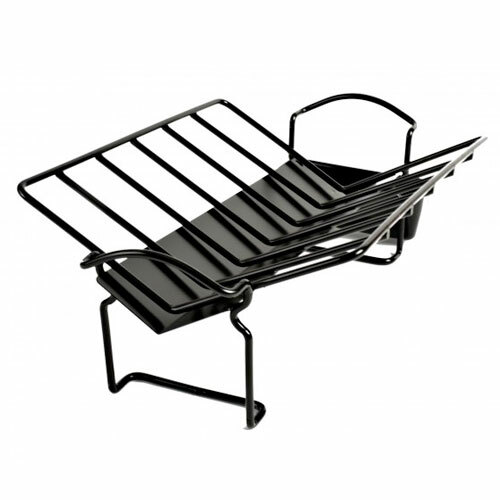 Roasting Rack w/ Juice Reservoir | Patio and Hearth Co. The roasting rack that preserves flavorful juices. Rack is pitched on a slight incline allowing juices to run into an attached reservoir a food cooks, making it a simple matter to whip up smoky gravy, or reserve the cooking juices for basting. Built-in heat shield reduces the incidence of flare-ups on the grill so food is less prone to charring. May be used on the grill or in the oven. Inquire about Roasting Rack w/ Juice Reservoir using the form below.